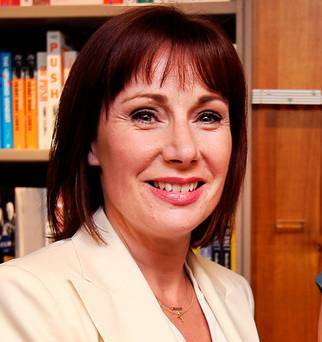 Culture Minister Josepha Madigan was met with protesters as she issued a warning over the “brazen discrimination” against women in the Catholic Church. She was met with pro-life campaigners bearing placards as she addressed the We Are Church Forum on Monday evening. The event had been scheduled to take place at the Mercy Sisters’ International Centre in Dublin but had to be moved to a hotel after pro-life supporters threatened to stage protests outside the nuns’ venue over the Minister’s support for abortion. A small group of protesters gathered outside the hotel where the talk was taking place carrying placards and a cross. Sisters Noeleen and Fiona Larmon from Swords, Co Dublin, told the Irish Independent that they were pro-life Catholics. Fiona Larmon called on Archbishop Diarmuid Martin of Dublin to “publicly excommunicate” the Minister for her pro-abortion and pro women priests views. “Why are women forbidden from even being considered as members of the clergy not to mention become an integral part of a new dynamic, representative, equal Church?” challenged the politician, who acts as a Minister of the Word in her local Dublin parish. She referred to the row last June when she, along with two other women from Mount Merrion parish, presided over a liturgy of the Word when there was no priest to say Mass. The Minister also highlighted how parents are forced to admit to their daughters, “you can be an altar girl but don’t get too ahead of yourself, you will never be a priest. Even if you feel that God has called you, you are forbidden. That vocation is only for a man. Underlining that it is not women that need church leadership positions, rather she said it is Church leadership that needs women. She quoted from Catholic Church statistics which show that in 2008, nearly 49,631 of the world’s 218,865 parishes did not have a resident priest. According to the Vatican’s Pontifical Yearbook for 2017, women comprise a majority (56pc) of all consecrated people within the Church. She contrasted the situation of priestless Catholic parishes in Ireland to the Protestant Churches which, although a minority, has over 400 women in ministry at various levels, including as ordained members of the clergy, among them Bishop Patricia Storey of the Diocese of Meath and Kildare.